The Holy Spirit was always and is always our resource to worshipping the true God, and to avoid the worshipping of any false gods. It is difficult to know where to begin exploring something as transcendent as the Holy Spirit. This ubiquitous Being has been present since the beginning of time as well, yet was only recognized as part of the godhead by the church fathers at the Council of Nicaea in the fourth century to combat the Arian controversy. Boy, were they ever busy. It would be so easy to dismiss the Holy Spirit’s divinity for that reason alone. And many have. think about the pervasiveness of electricity. It powers ours homes, office buildings, whole cities, and all our modern conveniences. It is a physical phenomenon but has no physical body. We can see it sometimes in its most scary and dramatic displays as lightning, causing fires and widespread destruction. But there are also milder forms, like electric currents producing static electricity that makes hair stand on end and gives a shock when a door handle is touched. The most important thing to remember here is that scientists and inventors (like Ben Franklin, whose famous experiment with the kite on a string with a key brought lightning out of the clouds and into our homes; and Thomas Edison, who brought us the lightbulb) didn’t invent electricity. They discovered it. Electricity had been in the world since the beginning of time as electromagnetism, one of the four forces of physics. All man did was discover how to order it, harnessing its power and its benefits for the flourishing of humanity. I would like to think of the Holy Spirit in somewhat the same way but on a far grander scale. He has been operating since before “in the beginning . . .” (Gen. 1:1). I don’t think it’s possible to control the Holy Spirit, but I do think it’s possible to understand his divine and glorious power. If we recognize the Spirit’s power and submit to his authority to lead us to the Almighty. 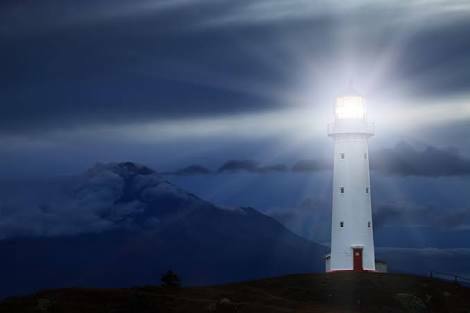 To understand more of the Holy Spirit’s power, let us return again to the lighthouse, standing strong and tall on the edge of a precipice or in the midst of troubling seas. See the light in the lighthouse? It’s the lamp burning inside, pointing the way to safety. And remember that the light defines the lighthouse’s whole purpose for being. Now, imagine yourself to be a lighthouse, planted firmly in a world that you did not create, but a world that has created you. Ask yourself, “On what or to whom is my light pointing? To what do I look to for safety? On what or whom does my light shine?” We cannot look to ourselves because we are part of the mechanism. The light of the lighthouse looks out; it does not look inward. It looks out to find, to search for lost souls. However, our light searches not to find, but to be found. This is the dilemma of the human heart. It looks for that which will give it purpose and a reason for being. This is glory. This is the act of worship. It is holding something up and bowing down to it. Of shining your light on something, around it, and through it, believing it will define the purpose of your light. The Holy Spirit is the one that directs our light to God. Its job is to lead us to the One who can keep our lights burning bright, powering them and giving them their true purpose.